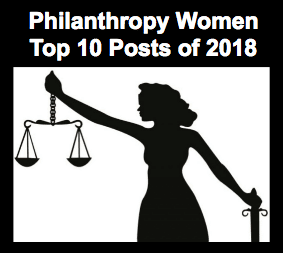 Top posts on Philanthropy Women in 2018 featured major investments in women and girls of color, strategies working to increase political leadership of women, and profiles of new leaders in the field. It was an amazing year for women’s philanthropy. Amid an increasingly hostile political climate, women managed to get elected to public office in record numbers, partially due to the influence of women donors. In addition, the events of #MeToo and the Kavanaugh hearings served to highlight how prevalent sexual assault and harassment are, and how far we still have to go to become a culture that truly values women and prioritizes their safety and equality. 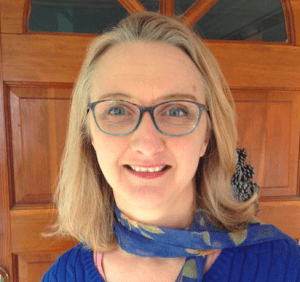 Our top posts here at Philanthropy Women were focused on emerging leadership for the sector as well as noteworthy strategies for giving. 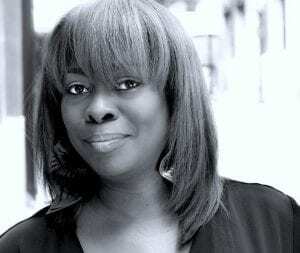 We profiled unique givers like Abigail Disney, and talked with new strategists in the field like LaTosha Brown. These posts highlight a diverse array of ways that women’s philanthropy is forging new ground and bringing needed attention to a wide range of social and cultural issues. #9: How Do We Get More Men to Proclaim their Feminism? Like What We’re Doing? Support Us! Subscribe to Philanthropy Women. Ana Oliveira, President and CEO of the New York Women’s Foundation (Image Credit: Donna F. Aceto) The New York Women’s Foundation received $2.25 million from CBS. CBS corporation announced today that 18 organizations will receive $20 million in funding to address sexual harassment in the workplace. Many of these organizations are longtime players in the women’s rights space, including New York Women’s Foundation, Women’s Media Center, and the National Women’s Law Center, while others are brand new to the field, like TIME’S UP. These grants are part of CBS’s separation agreement with former CEO Les Moonves, which stated that the donations would be deducted from his severance pay. CBS worked with expert advisory firm RALLY, to develop criteria for making these grants, which were given to organizations targeting three goals: increasing women in positions of power, educating and changing culture, and supporting survivors of gender-based violence. While this is definitely good news for feminist philanthropy, some would argue that $20 million from CBS should be just the start, and that many corporations in the U.S. have much more work to do in order to address sexual harassment. For starters, other big media corporations who have had similar issues should follow suit, including Fox News (Sean Hannity and Roger Ailes), NBC (Matt Lauer and Tom Brokaw), PBS (Garrison Keillor), ESPN (Donovan McNabb) and the NFL Network (Heath Evans and Marshall Faulk). There is still a great deal of compensation due to community-based #MeToo movements that are working to address gender inequality and create a healthier and safer culture for all. 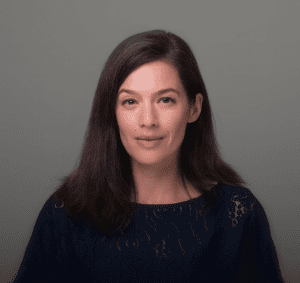 As part of the grantmaking from CBS, The New York Women’s Foundation received $2.25 million in funding to support The Foundation’s Fund for the Me Too Movement and Allies (The Fund). The Fund will take a systemic approach to addressing the problem of gender-based violence by beginning a new partnership with women’s funds in the community. 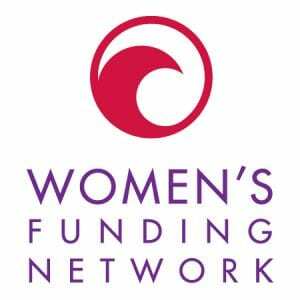 The partnership’s initial membership includes the Washington Area Women’s Foundation, Women’s Foundation for a Greater Memphis, Women’s Foundation of Minnesota, Women’s Foundation of California, Women’s Fund of Western Massachusetts and Women’s Funding Network. “Other public women’s foundations are welcome to join the partnership,” according to a press release announcing the grant. The #MeToo Fund is led by Ana Oliveira, President and CEO of The New York Women’s Foundation, and Tarana Burke, Founder and Leader of the ‘me too.’ Movement. Based in New York, the #MeToo Fund recently made its first set of eight grants to support organizations around the country working to address gender-based violence and support healing. Organizations interested in applying for grants from the Fund for the Me Too Movement and Allies should email metoofund@nywf.org. 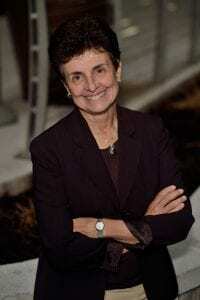 WPI Study: What Influences Men Vs. Women to Give to Gender Equality? WPI’s new report has important implications for both fundraising and the role of philanthropy media in spotlighting gender equality giving. The phenomenon of watching others do something before we do it ourselves: it’s a process that seems hard-wired into humans. And in fact, prior research from the Indiana University Lilly Family School of Philanthropy shows that when we see others giving to charity, we are more inclined to engage in that same giving behavior ourselves. Now, new research from the Women’s Philanthropy Institute investigates how the process of observing giving behavior in others plays out differently for men and women, particularly when they are considering making a donation to women and girls. This new research, funded by the Bill & Melinda Gates Foundation, uncovered a significant gender difference: women only need to see other women as role models in order to be influenced toward gender equality giving, whereas men need to see both men and women as role models in order to be influenced toward the behavior. “Women’s and girls’ organizations and fundraisers in general can use this research to take concrete action to increase their fundraising,” said Debra J. Mesch, Ph.D., the Eileen Lamb O’Gara Chair in Women’s Philanthropy at the Indiana University Lilly Family School of Philanthropy. One solution to this problem: showcase men giving to women’s and girls’ causes alongside women. This research suggests that fundraising professionals can potentially reach more male donors by featuring testimonials and donor stories from men about their decision to fund women’s and girls’ causes. The study also notes that fundraisers across philanthropy would do well to apply this finding to any other group of donors that may not be giving to their fullest capacity. The research validates that testimonials and donor spotlights on a diverse range of givers may help more people envision themselves as givers to any cause. “Apply this ‘visibility’ strategy to any group that typically gives less frequently to your organization,” advises the infographic that accompanies the report. 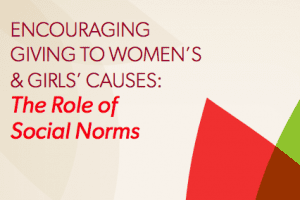 This study affirms that having visible role models is key for any social movement. As more stories of gender equality giving make it into the mainstream media, more people are able to find role models to envision themselves giving in this way. While publishers in the philanthropy sector like The Chronicle of Philanthropy, Stanford Social Innovation Review, and Inside Philanthropy all cover gender equality giving, it would be helpful if they shared more stories that feature a wider range of givers to gender equality, so that the public has more examples of how different people arrive at gender equality giving as a priority. The reports speaks to the role that social media sites like Facebook and crowdfunding sites like GoFundMe play in increasing the visibility of people giving. We here at Philanthropy Women would argue that another important part of the landscape for social visibility and discourse around feminist philanthropy is specialized publishing on the subject. Many philanthropy media sites feature stories of gender equality giving, but Philanthropy Women is the only publication specifically dedicated to profiling this uniquely powerful work. Author Kiersten MarekPosted on December 11, 2018 December 12, 2018 Categories Fundraising, Gender Lens Grantmaking, Girls, Philanthropy Women, ResearchLeave a comment on WPI Study: What Influences Men Vs. Women to Give to Gender Equality? The Art for Justice Fund has awarded the New York Women’s Foundation $300,000 to pursue criminal justice reforms that will keep women and girls out of jail and prison. What is the capacity for art to influence social change? The New York Women’s Foundation and its Justice Fund now have more funding to explore this question, particularly as it relates to women and girls involved with criminal justice. Recently, The New York Women’s Foundation (The Foundation) announced receiving an award of $300,000 from the Art for Justice Fund. The grant will go to support The Justice Fund, a seven-year initiative launched under the umbrella of the foundation in fall 2018. The goal of the Justice Fund is to decrease mass incarceration and overcome the negative impacts of incarceration on women and girls. The Justice Fund is working toward this goal by supporting organizations using art to promote justice, safety, and well-being in the community. “We’re so thankful to Agnes Gund, the visionary and transformative philanthropist, who founded the Art for Justice Fund,” said Ana Oliveira, President and CEO of the New York Women’s Foundation. Gund is also one of the first members of the Foundation’s Justice Fund collaborative, and was one of the earliest supporters of The New York Women’s Foundation. The Art for Justice Fund is a five-year initiative created by Agnes Gund and dedicated to reducing mass incarceration through the collective action of artists, advocates, and donors. Rockefeller Philanthropy Advisors and the Ford Foundation are also partners in the endeavor. One unusual aspect of The Justice Fund is its family-centered approach. “Women and families are seldom at the center of criminal justice reform and when women are incarcerated, the ripple effect on their dependents is profound,” said a press release announcing the $300,000 donation. The Justice Fund is working at the crosshairs of art and social justice in an attempt to influence public systems, including the courts, health care, housing, child welfare and immigration. Through artist expression, advocacy and coordinated giving, the Justice Fund is advancing a strategy that is aimed at the root causes of social and economic inequality. 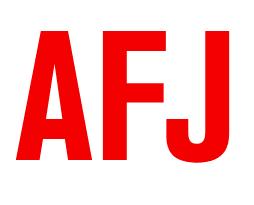 A full list of grantees can be found at the Art for Justice website. Recently, I listened in on a call hosted by Catalyst at Large Suzanne Biegel, and author David Bank of Impact Alpha. Guests on the call included Luisamaria Ruiz Carlile of Veris Wealth Partners, which specializes in gender lens investing and research. The call provided fascinating insights into the world of gender lens investing. Though in its early formative years, gender lens investing is a growing area of financial investment that is destined for big things. Biegel began the call by giving an overview of both the expanding language and the expanding financial investments in the gender lens investing sector. “Gender lens investing is still small in the relative scheme of things, but it’s so much bigger than it was,” said Biegel. She shared the latest statistics from Project SAGE at the Wharton School of Business Social Impact, which turned up a record 87 funds that are now investing with a gender lens, with 46 of those funds being new creations that occurred between 2017 and 2018. Biegel described how these funds are more geographically diverse than ever, and also semantically diverse. 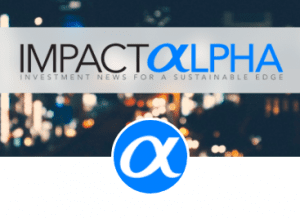 Along with gender lens investing, the terms used to described this evolving market have branched out with “gender effect, gender smart, and gender alpha,” and the range of approaches being used have also expanded, with the number of different strategies being used going form 12 in 2017 to 35 in 2018. Across all strategies that include at least one factor of gender analysis, VERIS wealth partners are reporting an estimated $843 billion in money manager assets being devoted to gender-based investing. Luisamaria Ruiz Carlile of Veris Wealth Partners joined the conversation by recognizing that “we are early on in trying to capture the gender alpha” since the investment sector is so young. Carlile suggested that as more prominent pension funds take on forms of gender lens investing, this could be an important signal to the market that these funds are growing in value and mainstream influence. She gave the example of State Street’s signaling when they unveiled the fearless girl statue on Wall Street as they announced the new ticker for their gender lens ETF. Carlile talked about how funds managers are listening more to women on the ground running successful businesses, and this is adding to the ability of women to function more powerfully as business owners. To expand on this point, Sharron McPherson joined the conversation and talked about the organization that she helped co-found — Winde (Women in Infrastructure, Development, and Energy) — a collective of 2,000 women construction and real estate professionals in Africa. The call also highlighted the importance of gender lens public initiatives such as the one taking place in the New York City Economic Development Corporation under the leadership of Eric Clement. This initiative is providing $10 million to back women entrepreneurs in New York City and help build a more gender diverse procurement pipeline for public sector projects. While gender lens grantmaking and gender lens investing are separate areas of feminist activity, it’s important to recognize that the two have some overlapping purposes. Biegel emphasized how gender alpha investing provides a value dividend across multiple domains — by growing women’s leadership in government and business, for example, while also addressing issues that disparately affect women and girls such as education and health care, or women’s leadership in steering efforts that address water access and climate change. Cynthia Nimmo: Bringing together leaders in gender equity is what we do best, and this year we hosted three powerful summits across the U.S.: Women + Money; Women and Men as Allies; and Women + Power. Each were sold-out and drew influencers from sectors beyond philanthropy, including fashion, finance, technology, and sports. It’s been an absolute highlight to widen our circle to include the ever-growing audience of those who invest in gender equity. There’s an alchemy that takes place at our summits, and it doesn’t end when the day is over. Beyond programs and grantmaking, a majority of the members and allies within our network are advocating successfully for policy changes to improve the lives of women and girls. This multi-pronged approach is what creates lasting change, and this year they asked for opportunities to use their voices together. Members signed a joint statement decrying the separation of children from their parents on the U.S. border, as an example. When foundation leaders representing $50 – 80 million/year in grantmaking stand together, it’s meaningful. KM: What epiphanies about gender equality came up for you or your staff this year? CN: The epiphany came around how many people are involved in gender equality, men and women, from within philanthropy and beyond. Another is about necessity of including a racial equity lens in gender equity work. One cannot exist without the other. For those of us working within philanthropy, tasked with funneling resources, we need to be ever-vigilant about who we partner with, how we partner with, and whose leadership is present. KM: What inspires you most about WFN’s work? CN: On the days it feels like there is a backslide for women and girls, I am energized and inspired by the massive number of women using their voice, their money, and their influence to be a part of the universal demand for gender equality. This wasn’t the case 15 years ago when I joined a movement that many considered to be outdated or unnecessary. The work was being done by nonprofits, researchers, and others. It wasn’t part of the mainstream conversation. Now, women from all walks of life and in all professions are looking at aspects of their lives – from their paychecks, to childcare, to the ads they see – and are asking for something different. If the change isn’t forthcoming, they themselves are taking up the mantle. Making the case for gender equity, highlighting ways to get there, and creating opportunities for others to be involved has been our mission for 30 years. It’s always inspiring! KM: In the next 10 years, where do you see gender equality movements taking us? CN: The conversation will become far more nuanced than a general push for equal rights. We’re already seeing the beginnings of this, from why it’s important to have more women in the corporate boardroom, to why having a representative government is critical for our democracy, even down to things like the authors of books being taught in public schools and the faces on our currency. In 10 years, women’s leadership will be visible in every facet of society. Advances in technology will support immediate sharing of information and opportunity for collective response in real time, in ways we can’t imagine. The programs that are being piloted now to educate boys on gender norms, will become commonplace. Women economists will be in demand, as they will have brought a deeper understanding to the general public about the policies and structures which have created the long-established wealth gap that is detrimental to the health of our families and our countries.